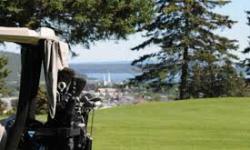 Le Loup Golf de Baie-Saint-Paul, Quebec, Canada is an 18 hole, par 72 Golf course offering a unique experience for Golfers with spectacular views of the river, sea and mountains, and a wonderful location in the beautiful Charelevoix region. 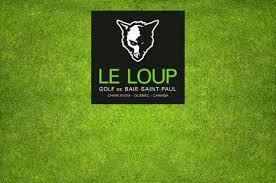 The Club House has snack bar Le Terrier near the 9th hole, a Club House bar with outdoor terrace overlooking hole 1's tee off and hole 18 so you can watch the players come in while enjoying a relaxing drink, they also have the Orange Bistro Restaurant with all who dine here receiving a free cocktail or after dinner drink. 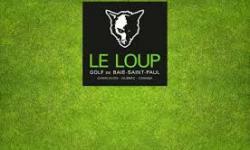 Le Loup Golf de Baie-Saint-Paul has a Golf shop with quality Golf clothes, equipment and accessories, a practice field with protective netting and practice mats, and the Golf professional offers Golf lessons to players of all levels. 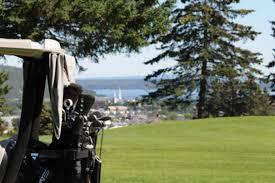 Come for a wonderful game, here they strive to exceed all your expectations.